There is a member in every family who has a habit to preserve everything whether it is old or not useful. Do you think before throwing stuff out that it is still useful or not. If no, you may regret now after reading this news. Almost everyone likes coconut. It is a truly healthy for our body. We always use the inner part of the coconut ad throw the outer shell. If you have thrown it away recently then read this article. 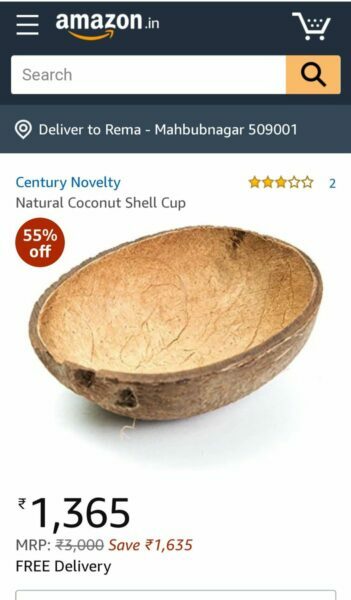 How would you react, if we tell you that the outer shell of the coconut is being selling on Amazon site with a prize tag of Rs. 3,000. The e commerce site is selling the outer shell of coconut with 55% discount. And after discount it will cost Rs. 1365 to the buyer. It is first noticed by the twitter user @rama_rajeswari who also shared the screenshot of the product on the twitter. And the biggest thing is that the website is selling the half shell with the price of Rs. 1365. When the twitter user shred the news on thier twiiter account, people started commenting on the post which also are too hilarious to see. Next article Is Sunil Grover joining the Kapil Sharma Show?